A Karel Appel exhibition opens at the Phillips Collection. Karel Appel, Floating like the Wind, 1975, oil on canvas 79 x 103 in. 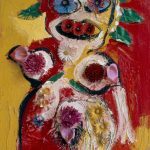 Karel Appel, Woman with Flowers No.1, 1963, plastic flowers and oil on canvas, 45 x 35 in. In Jan Vrijman’s 1962 film The Reality of Karel Appel, Appel is seen vigorously—if not violently—slapping paint onto a large canvas in his Paris studio. He hurriedly mixes his paints directly on a nearby tabletop, as if scrambling eggs or whisking a complicated French sauce. The Dutch painter scoops a gob of paint with his palette knife and pivots on his heels. His arm winds back and then hits the canvas, marking it with thick streaks of color. Tubes of paint are hastily squeezed in a jagged, intermittent motion onto the canvas, as well. Appel’s breathing is heavy; he is working hard but intuitively. In a voiceover the artist says, “I paint like a barbarian in a barbaric age.” (“Barbaric” here seems less in line with the Greek barbaros, which referred pejoratively to non-Greeks, but closer to the philosopher and Marxist theorist Rosa Luxemburg’s usage in 1916, which pronounced society at the crossroads of a “regression into Barbarism,” meaning the “annihilation of civilization” in light of world war and imperialism.) Vrijman cuts to shots of the city buzzing with activity, set to a soundtrack of Dizzy Gillespie. Back in the studio, Appel continues to paint as before, now with an experimental composition of his own playing in the background. His actions come to an apex, the painting is finished, and then everything is calm; Appel is pictured sipping tea from a teacup. After creation there is a period of rest—God rested on the seventh day after six days of creating the world; the alchemist rests his materials after they have been placed under intense heat so that they might congeal into precious metal; the artist pours himself a cup of tea after battering his canvas with paint and exhausting himself. Appel was raised in Amsterdam. He began painting in his teens and eventually studied at the Rijksakademie in the early 1940s. He was a founding member of CoBrA (an acronym for Copenhagen, Brussels, Amsterdam), which was formed in 1948 and, though short-lived (it disbanded in 1951), proved to be a highly influential avant-garde art movement in Europe in the wake of World War II. 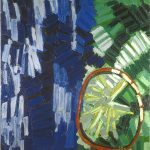 Experimentation, spontaneity, and disassociation from all other art movements—naturalism and “sterile” abstraction chief among them—were the tenets of CoBrA. 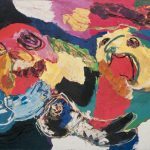 The group’s output primarily consisted of highly colorful semi-abstract canvases with energetic brushwork. Their figures were so primitively simple that their humans, like de Kooning’s women, seemed perverted and their animals seemed sacred. On his own, Appel went on to create work in various media—painting, sculpture, photography, dance—until 2004, two years before his death. Throughout his life, he lived and worked around the world: Paris, Monaco, New York, Zurich, Florence. Appel, who achieved a great amount of notoriety in Europe during his 60-year career, is not as big a name stateside. In general, postwar European art is not nearly as well known in America as it is in Europe. Americans tend to be more familiar with art made in Europe before World War II. However, museums and galleries in the U.S. are beginning to promote more awareness of European artists who were making art in the wake of war and destruction. 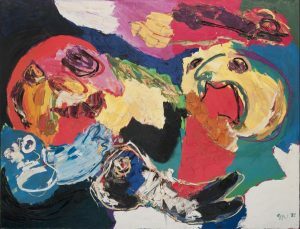 The Phillips Collection in Washington, D.C., will mount “Karel Appel: A Gesture of Color” this summer (June 18–September 18), bringing the artist’s exuberant style to an American audience. 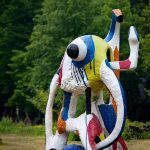 The show comes on the heels of a gift of seven works by the artist—five paintings and two sculptures—from the Karel Appel Foundation in Amsterdam. The pieces will not only stand out in the museum’s collection as dazzling accomplishments in their own right but will also resonate with the Phillips’ works by Bonnard, Picasso, and van Gogh—names that American viewers are at home with. “Gesture of Color” is one of a flurry of international exhibitions of Appel’s work. Blum & Poe, a gallery with locations in New York, Los Angeles, and Tokyo, staged “Karel Appel” in the fall of 2014—the first overview of Appel’s work in New York in over 40 years. A drawing retrospective opened at the Centre Georges Pompidou in Paris in 2015 and traveled to the Staatliche Graphische Sammlung in Munich; an exhibition at the Gemeentemuseum Den Haag, Netherlands, closed in May; and a retrospective is planned for 2017 at the Musée d’Art Moderne de la Ville de Paris. Vrijman depicts Appel’s “reality” as one of extremes—the wild man and then the European gentleman. Ottmann describes Appel as an “enfant terrible.” The curator says, “He was very provocative and very much about making a spectacle.” Yet there was another side to Appel, who also composed music and poetry. 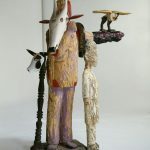 “He seemed like this primitive madman, but he was also this very sensitive, poetic artist,” says Ottmann.